What’s the most conventional way to invest money? The stock market? A 401K? 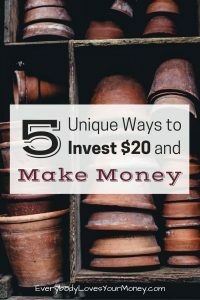 Those are terrific and can make you very wealthy when used accordingly, but if you have a few bucks in your wallet and want a few unique ways to make it grow, here are five ways to invest $20 and make money. You probably can’t buy a Chick-Fil-A franchise for $20, but you can reshape your financial future in other ways with it. Let’s see how. 1. Selling Collectible Items (That Are Really Worth Money) – The key to success in this type of investment is two-fold: A. Research. B. Finding the right buyer. For example, in 2015, news traveled around the internet that Disney VHS tapes that were Black Diamond edition were worth thousands of dollars. “Beauty and the Beast” was supposedly selling on eBay for $10,000. Unfortunately, Snopes debunked that myth and most of the rare tapes sold for $25 or less. One collector did weigh in on the question of whether the VHS tapes were worth anything and said to find the extremely rare ones. They were likely worth a great deal more for the right buyer. Other collectible items are rare pieces of currency, antique furniture, vintage dolls, or artwork. The more research you put into it, and the more luck you have finding the right buyer, the better you’ll succeed. 2. Domain Names – Ever thought of collecting domain names to sell? According to Investopedia, you can make a solid go at building a domain name portfolio. For example, you’ll want names that are relevant, geographical, or business-oriented. Check out Investopedia’s full instructions on how to get started, and where to find the right auction here. 3. Overhauled Pottery & Decor – I once interviewed a member of a Facebook Buy, Sell & Trade group who had tremendous returns on her DIY efforts. She purchased nickel and dime pieces of pottery or run down pieces of furniture from thrift stores. After some TLC, paint, and character, each piece sold anywhere from $10 to $50. If you want to invest $20 on a few thrift store items and some tools, this is an attainable return on your investment. Perhaps, you could join a few Facebook garage sale groups or buy, sell & trade groups to get a vibe of what products are selling and at what price points. 4. Consignment Sales – The only money you need to invest in a consignment sale is the sign-up fee and any supplies you might be liking (i.e. tagging gun, packaging tape, etc.). So, every time I’ve gutted my storage room and hauled everything to a consignment sale, I’ve made between $100 to $300. It’s a lot of work. But, you’re helping local shoppers find some quality stuff for clearance and you’re potentially earning tenfold on your investment. Product Reviewer – via YouTube, vlog, Periscope, Facebook Live, etc. For ways to make money on the side, more than just $20, check out these great articles.